Simon Dudar is a fourth grade teacher at Haldane School in Cold Spring, NY. He was introduced to the JBFC by his principal, Brent Harrington, whose son had been a student at the Media Arts Lab. If you were to walk into most classrooms during a typical math lesson you would probably find a teacher giving a 15 minute mini-lesson on a particular skill, followed by some student group work and discussion, 15 minutes of independent practice in a work book, and a quick wrap up. Learn, practice, discuss. Sprinkle in a little real world application with some word problems about a lemonade stand, or a county fair. Done. Now the lesson is meaningful. Except there’s no creativity, ingenuity, and kids can’t wait for the lesson to end. I face this challenge on a daily basis. How do we find time to allow kids to be creative, while still ensuring we are getting through the curriculum? It may be easier than you think. For the past two years I’ve been working with the Jacob Burns Film Center and they have completely changed my approach to teaching through one simple notion: every kid likes movies. Following a great experience with Focus on Nature and helping my students produce short research-based mini docs about wildlife in the nature trails around our school, I participated in the Summer Teachers Institute. I spent a day and a half with Joe Summerhays, learning the art and craft of stop motion animation, and understanding how the rigor, standards, and assessments required by the state can coexist with creativity. My first unit in math dealt with rounding numbers, and the powers of 10. Not to mention a review of multiplication and division. 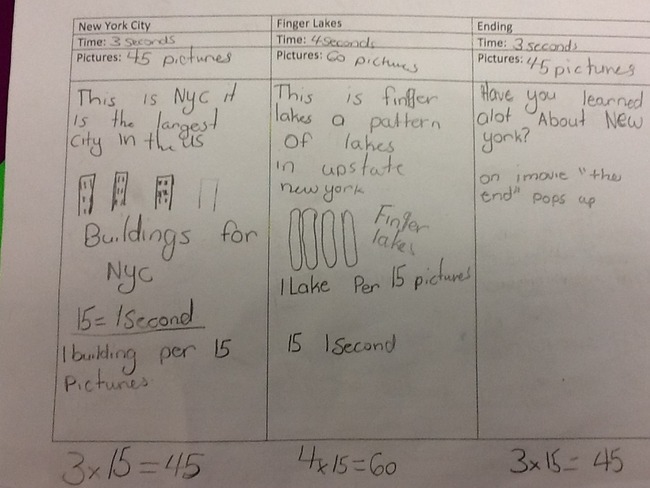 I also had to fit in my New York State Geography unit, and some reading and writing during the day as well. The good news: using stop-motion animation we were able to do all of it at the same time. 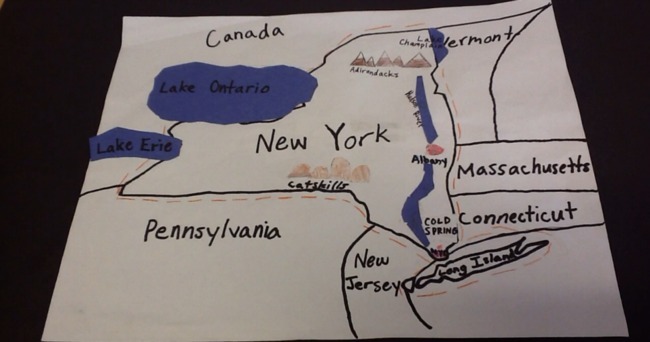 Starting on the first day of school my students set out to make the typical map of New York State by copying a map out of a text book onto a blank one. However, the only difference was that our map would be animated. 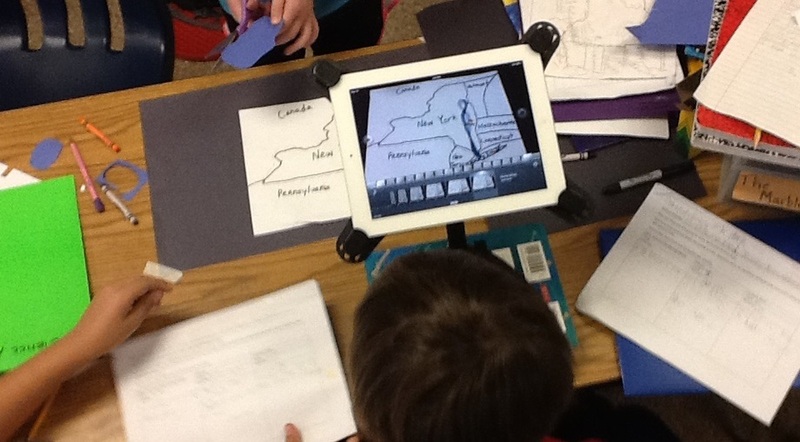 Starting off with a storyboard, each geographical feature had to have information attached to it. This meant research, and then a written paragraph and revision that was then read aloud while a peer timed it. Now the math. Since the animation is shot at 15 frames-per-second, a lot of planning has to go into it to make it just right. Conversation like this took place for 20 different geographical features on the map. Each one was meticulously planned out using words, sketches, and mathematical equations. The result was a 2-3 minute animated tour around New York. The movies were then posted on our class website so that parents, friends, and of course grandma in Texas could view the final product. Creativity, critical thought, collaboration, problem solving, and fun became a staple in the classroom. And a simple animation made it all possible. To check out the fantastic animations created by Mr. Dudar's fourth graders, take a look at their class blog.